Put the short crust pastry on baking pan. Pour JUST MILK into a fairly large saucepan. Split the vanilla pod down the middle with a sharp knife and whilst holding the pod over the pan of JUST MILK, scrape out the black seeds and add them to JUST MILK. Add the pod itself JUST MILK also. Heat JUST MILK over a medium heat until small bubbles begin to appear. At this point, remove the pan from the heat, cover with a lid and set aside for about 15 minutes. After this time, remove the actual pod from JUST MILK and discard. In a medium sized mixing bowl, beat together the egg yolks and the sugar until a light and creamy mixture appears. Prepare a saucepan of hot water and leave on the stove. Remove the lid from pan containing JUST MILK and vanilla and gradually pour JUST MILK into the egg yolk and sugar mixture in the mixing bowl. Stir continuously whilst adding JUST MILK. Once all of JUST MILK has been added, place the mixing bowl over the pan of hot water and set to a low heat, ensuring that the water does not boil. Cook the custard for about 10-15 minutes, stirring constantly until the custard thickens to the desired consistency. Pass through a sieve and add a small amount of grated nutmeg. 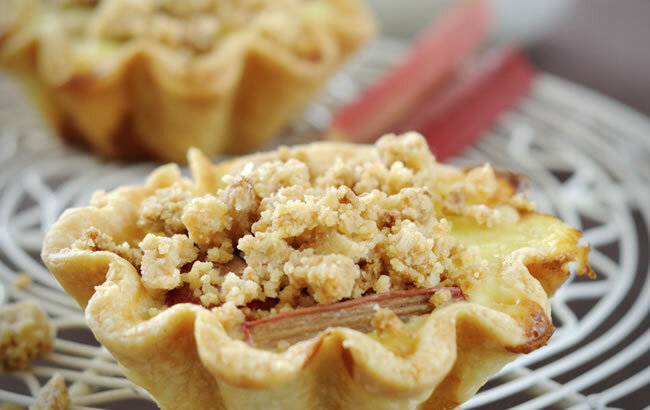 Pour the mix into the tart shell, add the rhubarb at the top, and bake on the middle shelf of the over for 30 – 40 minutes or until the custard appears set but not too firm. Turn the tart out onto a plate and serve.